Alkalinity, also referred to as carbonate hardness or buffering capacity, is essentially a means of quantifying the stability of pH in a solution, such as aquarium water. In an aquarium, weak acids formed by oxygen respiration and the decomposition of organic material gradually deplete alkalinity. If left unchecked, the alkalinity drops below a critical level and pH begins to fluctuate more wildly than is normally suggested (a daily pH shift of +/-0.2 is normal in marine aquaria), causing stress to livestock. Alkalinity is also depleted by reef-building organisms during the production of aragonite (~60% carbonates by weight), and is therefore very important for their rapid growth. 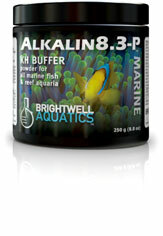 Maintaining the alkalinity in marine aquaria between 7 – 12 dKH (2.5 – 4.3 meq/L) will generally maintain pH within the desired range. Basic: Dissolve 2 grams (~½ teaspoon) of product per 20 US-gallons of aquarium water in 8-fl. oz. of fresh water; add every other day or as needed to maintain the alkalinity within a range of 7 – 12 dKH. When used in this fashion, 1,000 g treats up to 10,000 US-gallons (37,854 L).